Black Friday went beyond expectations in 2017. On 24 November 2017, global consumers’ activity increased on average by 624% when compared to an ordinary day. Last year the increase was 619%. South Africa boasted some compelling Black Friday activity, including a 936 percent surge in website sessions. Those users fueled a 16,226 percent spike in transactions relative to a typical day, and given their savings, it’s not hard to see why. Here is the list of the shops that were offering Black Friday 2017 deals in South Africa. 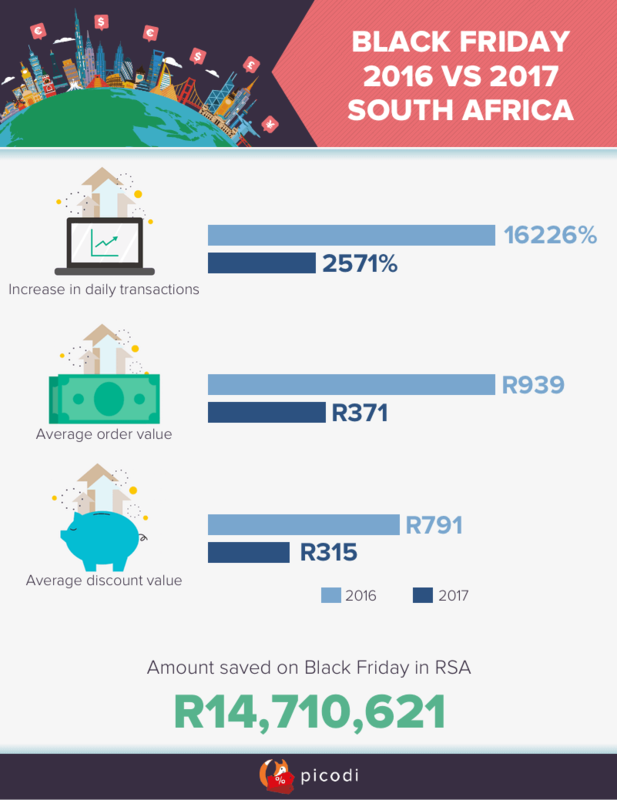 According to research done by Picodi, on average, South African users saved R791 on Black Friday, up from the R657 they saved on other days of the year. Their discounts also amounted to 60 percent on average, compared to the typical 45 percent. These numbers translated to a massive R3,909,806 in savings for the country as a whole, proving South Africa does Black Friday right. Unsurprisingly, South African consumers were buying more actively than usual. The number of sales increased by 2571% on the day of Black Friday. This is, however, a less impressive number than during Black Friday 2016 when the increase in transactions was a staggering 16226%. According to Picodi, an average value of South African cart reached R371, which is less by R568 comparing year to year (R939) An average discount percentage during Black Friday reached 61%. That brought R315 in savings. Cumulatively, South African consumers saved R14,710,621 thanks to the Picodi website. The most popular categories this year were Fashion, Electronics and Cosmetics. When it comes to the most popular shops Woolworths, Edgars and Makro took the three top spots. As for the devices used for online shopping most of South Africans preferred smartphones (48.5%) over desktop computers and laptops (46.5%). Tablets were used by 5% of shoppers.